After running around non-stop for 6-weeks in Europe-- shooting all day, editing all night, and eating to our hearts delight, we knew we needed a bit of a detox when we got back home to Bali. To be honest, we didn't for a moment regret the hectic schedule we had in Europe. We knew it would be a crazy 6-weeks, and we wanted to soak in the full experience-- including eating pretty much everything in sight along the way, haha! ((I mean, how could you possibly go to Europe and say no to croissants + gelato before and after meals?!)) With that being said, we do FULLY believe in living a balanced lifestyle, and that meant it was time to get back on track with our health asap-- so I wanted to break down for you guys exactly how we've been refreshing ourselves from the inside to the outside this month for our 30 Days of Self Care in Bali! We've learned a lot while trying to stick to this cleaner way of eating in Bali, and we've also established some favorite cafes that were super accommodating for our dietary needs + restrictions! Alter Ego-- This is a fairly new cafe in Canggu, and we are in LOVE. Their menu is split in half between vegetarian and meat dishes, so it's super easy to find whatever you are looking for. They also have tons of vegan options as well! We've been for both breakfast and lunch, and we've never left feeling disappointed. If the photos don't have you drooling already, you should at least go for the good vibes... There's tons of space to work here with lots of greenery inside and floor to ceiling windows so you don't feel as if you're stuck inside all day while on your laptop! It's a win/win situation! Bali Bola-- This is a brand new cafe in Seminyak and it is safe to say we are completely obsessed with it!! From the interiors, the massive menu selection, and the freshness of each dish, it is overall an incredible place! You can tell by Bali Bola's quirky + fun designs that they pay close attention to details-- which was even more noticeable with every bite of food we tasted! Can I also mention that their juice + smoothie selection is super impressive, and I'm totally into their 'flexitarian' vibes!! Koloni-- Koloni is basically a hop, skip, and a jump away from where we stay in Bali in Berawa, and we have become complete regulars there! ((If you watch our insta stories, then you've seen this place time + time again!)) The staff are all so lovely and all feel like friends to us at this point, and the food is so fresh + delicious! There are SO many healthy options-- you almost feel healthier just being there, haha. My go-to is the Buddah Bowl and Zach's is the Falafal Bowl. Both are really great and full of so many delicious veggies! Another way we started our mornings was by doing yoga, either at home ((we finally got our own yoga mats!)) or at Desa Seni. Desa Seni was the first place I ever tried yoga in Bali, and it has remained my favorite all these months later. I was so happy to try out some new classes with Zach! There are so many studios to practice yoga in Bali that it might get a little overwhelming when choosing the right one for you. However, we feel that Desa Seni has it all! 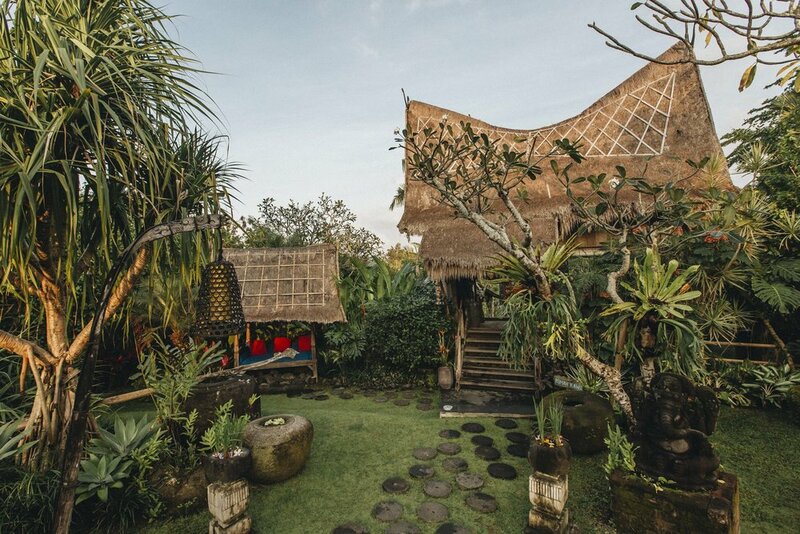 It is conveniently located in our neighborhood of Canggu, and is also a wellness retreat in itself that you could book a stay with. There are many classes to choose from when it comes to their yoga selection, and the yoga studio sits right in the jungle surrounded by the sounds and smells of a tropical oasis which alone is enough to make you relax! We are huge fans for many reasons, but it helps a lot that the environment isn't intimidating at all and the instructors are so lovely! Working out this month was one of our top priorities, and we tried to find ourselves in the gym at least 5 days a week. I am a firm believer in at-home workouts as well if you can't make it to the gym for whatever reason, or if membership prices just aren't in your budget at the moment. Don't ever let not having a gym membership keep you from staying in shape! I am one of those annoying people who really enjoy working out, and Zach is the complete opposite. I could probably count on one hand the amount of times the two of us went to the gym together when living in NYC, and it has been such a shock to see that completely change as our lifestyle has changed so much while living in Bali! We both feel so much better when we push ourselves to get to the gym-- and having the accountability between the two of us really helps too! Some days this month we worked out really hard and felt so accomplished, and others we barely did much at all, but getting into the habit of going to the gym this month really made an impact on both of us-- and now we are hooked. If you've been following Zach and I for any length of time, then you are fully aware that we both absolutely love massages! Nevertheless, they always feel like a special treat whenever we get one which is probably why we are so addicted because we love any kind of special treat, haha! Not only do massages make you feel pampered, relaxed, and luxurious in a way, but they are simply good for your overall health! They improve blood circulation, help to relieve stress and muscle tension in the body, reduce anxiety, remove toxins from the body, help promote healthy posture, and... need I say more?! There are so many benefits to getting massages regularly, and you will pretty much find us on a massage bed any chance we get. ;) We couldn't wait to get back to Bali after our European adventures because massages in Bali are on a whole other level! Sundari Day Spa in Seminyak-- Like I mentioned before, among many things that Bali is known for, add incredible spas to the list! There are tons of amazing spas on the island, but the type of luxury and affordability that you can find in Seminyak's Sundari Day Spa is simply unmatchable!! Their menu of treatments goes on and on, but we were really excited to try one of their rituals that is super unique to Sundari. We tried the Shakti Ritual, and the whole experience was so relaxing. We decided to end our month of Self Care with Sundari because it was literally the FULL treatment-- massage, body scrub, and aloe vera facial. The perfect trifecta for a pampering session! It's crazy what all of our faces are exposed to when we travel: the climate of a new country, pollution, new bacteria, wind, sun, etc. Not to mention what it is exposed to just being in an airport and traveling! My skin is always left feeling dry and tired after traveling. Zach and I want to create better habits when it comes to taking care of our skin-- especially as we get older and continue traveling more and more. Sofia Spa in Canggu-- After looking into several different spas in Canggu, we decided to go to Sofia Spa to experience some much needed TLC for our faces. 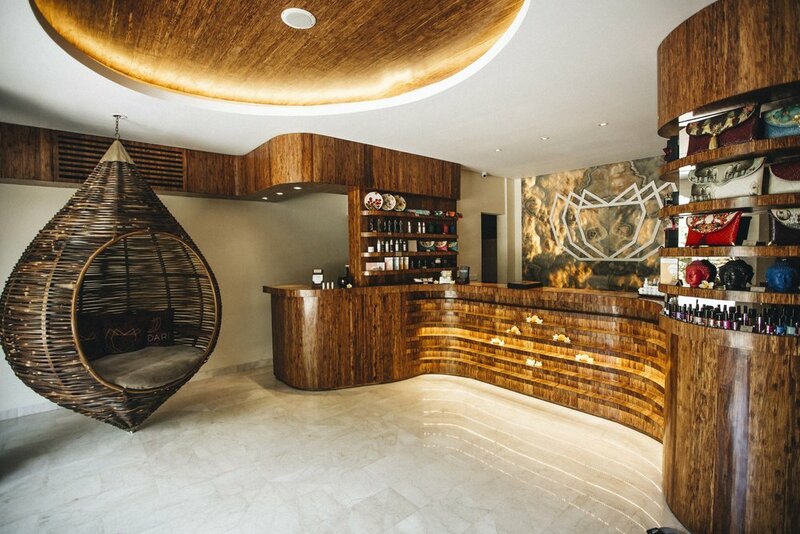 Sofia Spa has a lot to offer and to be honest, it was hard to decide on which facial to choose from-- but we went with the Collagen Regeneration + Detox Action facial, and we are completely hooked! This type of deep cleansing is very unique to Sofia Spa. The facial includes exfoliation and hydration by ultrasound, blackheads extraction, and a warm massage by infrared. It is an extremely deep cleansing facial and after leaving the treatment, we felt completely refreshed and renewed! Not to mention we continued to see positive results for the days + weeks to come after this treatment. It really was a game changer for us and this treatment alone is almost worth a flight to Bali just to experience it! Both Zach and I are almost 30 ((okay I always joke because Zach is 29 and I am 28, so technically HE'S almost 30 and I am just so, so far away... #jokes)) but we want to be intentional about the way we care for our skin these days. Starting to focus on our skin a bit more closely is something we hope to maintain for the months to come! Skincare is something that I always pay close attention to, so this month was no different in making sure I was taking care of my skin with a proper skincare regimen. However, I started using a new brand this month-- Mullum + Co.-- to try out a Bali brand, and I am already hooked! ((Which is saying a lot to be honest, because I am reeeally picky when it comes to skincare!)) I used to have terrible skin growing up, and so since I was in high school I've been very much into skincare and finding the right products to use on my skin. I am a firm believer in less is more when it comes to skincare routines-- and love using natural products that are found in the Earth rather than something full of chemicals that will cause me more harm than good in the long run. I was so excited to discover Mullum & Co. in Bali, especially because I am such a huge fan in oil cleansing! **PS-- All Mullum + Co. products are organic and vegan if that's your vibe too! Spending 30 days to really focus on self care has taught both Zach and I so much as we've taken the time to really slow down and notice how we take care of ourselves, as well as really listening to our bodies and figuring out what they need. I think when you don't take the time to slow down, it's much harder to interpret what your body is trying to tell you-- when it is screaming for rest, when something you are eating isn't sitting right with you, and when you need some serious pamper time. It's not realistic that every month will look like this past one did for us, but there are many things we've learned this month that we will continue doing to maintain a more healthy and balanced lifestyle. Traveling so much definitely takes a toll on you, and in order to maintain our jobs and lifestyles we are really trying to implement a lot more self care habits in our everyday life! I hope you guys enjoyed our '30 Days of Self Care in Bali' post! If you have any questions/comments, please don't hesitate to drop us a line below and we would love to get back to you! We always appreciate your feedback-- and really hope this post inspires you to take a closer look at how well you care for yourself!